Northland Investment Corp. wants to build a mixed-use development on a 22.6 acres at the corner of Needham and Oak streets. Above: A rendering of the proposal. Newton Mayor Ruthanne Fuller is pumping the brakes on her administration’s efforts to rewrite the city’s zoning rules. In a letter to city councilors, Fuller said she has asked the Planning Department to wait until 2020 to deliver a final draft of the new citywide zoning ordinance — the first such overhaul in 32 years — for the City Council’s approval. Fuller said her decision was also prompted by the city’s already “sizeable workload” reviewing two large-scale development proposals and carrying out other planning efforts. Fuller’s decision comes amid a larger debate over development in Newton. Residents have been divided at public meetings meant to solicit feedback on zoning proposals that could add hundreds of residential units, along with office and retail space, to some sections of the city. Critics have expressed concerns that developments will be too large, adversely affecting neighborhoods. This year, Fuller said, planning officials will be reviewing Northland Investment Corp.’s development proposal at Needham and Oak streets, and a separate proposal for the Riverside MBTA station. They are also working on “vision plans” for Riverside and Washington Street, a climate action plan, and an inclusionary zoning bylaw to promote more affordable housing. “Riverside, Washington Street, Northland, and the zoning ordinances are important, major significant projects and initiatives for the city,” Fuller said in an interview. “So I fully expected people to be very invested and to care and to keep up” with the proposals. Leonard Gentile, a councilor at large representing Ward 4, said the residents he has heard from “are looking for development that is properly scaled” for neighborhoods. He said the message being sent by those residents — that they don’t want Newton to become like Cambridge or Brookline — is not getting through in proposed developments and zoning. At the Riverside MBTA station, Mark Development and Normandy Real Estate Partners propose erecting 10 buildings where the existing parking and Hotel Indigo are located. The development would include 675 residential units, about 611,000 square feet of office space, a new 194-key hotel, and about 64,000 square feet of retail space. In a statement to the Globe, Robert Korff of Mark Development said the Riverside location is well suited for a mixed-use project with significant density. It would increase the city’s housing supply and provide economic development, more tax revenue, and better access to the Charles River. It would also involve investments in significant roadway improvements, including direct site access from the Route 95 offramp, to address concerns about traffic, he said. Northland Investment Corp. is proposing a 14-building development at the corner of Needham and Oak streets that would have 800 residential units, including 123 affordable units. The project would also have 180,000 square feet of office space and 115,000 square feet of retail and community space. He said that 45 percent of the site will be open space, with eight parks, a community building, a community playground, and a village green. The city is in the midst of a vision effort for Riverside, and city officials presume developers will file for a special permit this year. Northland has already filed for a special permit for its project. Fuller said the city has to respond in a timely manner to the development proposals, and she wants to have an updated inclusionary bylaw for affordable housing in place before city councilors cast any votes deciding the outcome of those projects. “With major developments coming in, we want to make sure we’ve got the inclusionary zoning in place so that it can guide those [proposals],” Fuller said. 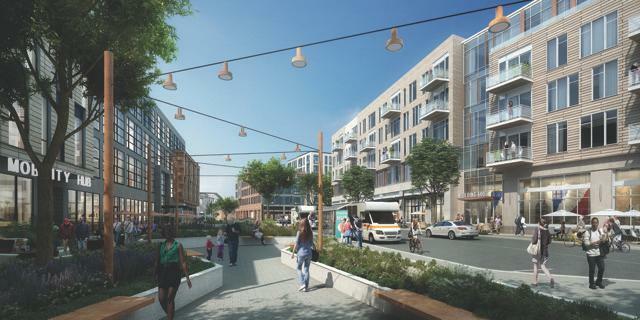 On Washington Street, officials have spent about a year working on proposed zoning rules to guide future development along a 2.5-mile corridor along the Massachusetts Turnpike. Mark Development is already building its Washington Place mixed-use development in Newtonville, while developer Scott Oran is building a separate mixed-used development on Austin Street. Both incorporate residential units and retail space. A draft version of proposed Washington Street zoning would allow up to 10-story buildings in some areas if developers agreed to contribute to a fund that would help pay for commuter rail station improvements and public parks built on decks spanning the Turnpike. Fuller said that Newton residents care deeply about their city and want to “proactively decide” the city’s future, instead of reacting to proposals from developers. “We want to preserve what is best about Newton and at the same time move forward to address housing affordability and traffic congestion,” Fuller said. Emily Norton, a Ward 2 city councilor, said the city is still moving too quickly on its work at Riverside, Northland, and Washington Street. She said she is concerned that the city is “bending over a little bit too much backward” for developers. Susan Albright, a councilor at large from Ward 2 who leads the city’s Zoning and Planning Committee, said in a previous interview that new development in Newton has been a good thing.